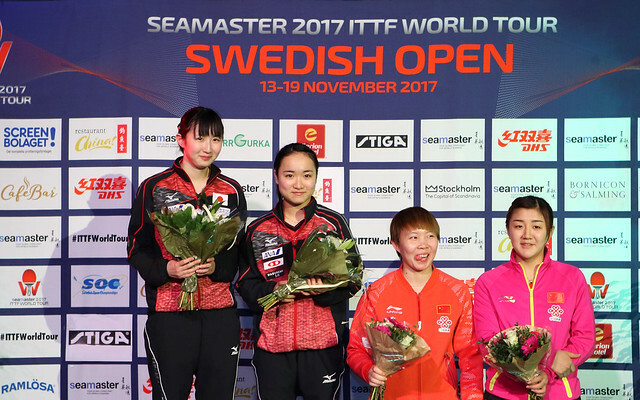 Successful in the qualification tournament, as play commenced in the opening round of the Men’s Singles event at the Seamaster 2017 ITTF World Tour Swedish Open in Stockholm on Thursday 16th November, Nigeria’s Quadri Aruna followed by Germany’s Benedikt Duda maintained that form. Quadri Aruna was the player to set the kettle boiling; playing in trademark style, big expansive strokes with a never-say-die attitude, he accounted for Hong Kong’s Wong Chun Ting, the no.5 seed, to cause a major upset. He won in six games, emerging successful in a contest where he made the best possible start by winning the opening three games, before Wong Chun Ting, the no.5 seed, mounted a most spirited recovery (11-7, 11-4, 11-8, 6-11, 2-11, 11-6). Success very much against the odds for Quadri Aruna; equally Benedikt Duda upset the pecking order but in the possibility of upsets was his defeat of Japan’s Yuya Oshima, the no.14 seed, the most probable? The right handed Yuya Oshima is very forehand orientated, Benedikt Duda, left hand with a strong forehand is a quite ideal foil in reducing the effectiveness of the Japanese player’s style. “The tactic was to play short to the forehand; then play long to the backhand. He plays the first backhand with spin but not with a great deal of speed, not powerful. He likes to step around his backhand to play his forehand but it is always across the diagonal so I was ready; also when he flicked the return of service, I was comfortable. The problem was mainly when he changed the service. I felt comfortable receiving from my forehand but I made mistakes from my backhand. He is very fast, very fast indeed.” Bendedikt Duda. Two upsets as the opening round commenced, in the two corresponding contests, the outcomes were as anticipated. Fan Zhendong, the top seed, beat Korea’s Jang Woojin (11-1, 11-6, 11-3, 11-9); Portugal’s Marcos Freitas, the no.14 seed, recovered from a two games to nil deficit to end the progress of Denmark’s Zhai Yujia (9-11, 5-11, 11-4, 11-8, 9-11, 11-3, 11-6). In round two Fan Zhending meets Benedikt Duda, Marcos Freitas opposes Quadri Aruna; the matches will be played on Friday 17th November.